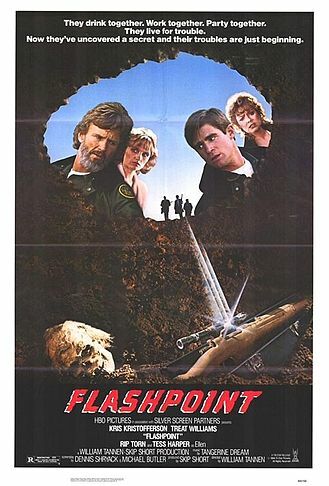 Flashpoint is a timely film from some thirty odd years ago. It is significantly uncanny in being able to canvas and reverberate near-identical issues that have propelled Donald J. Trump into the presidency. Most enjoyable of the entire B-film is its enmity toward the Federal State; as well as the sheer braggadocio of the members of the Border Patrol in complete uninhibited form. The film is dripping with testosterone in the most positive way; it exudes a classical American ideal of a man which is classless in its composure; and that is a man that is rambunctious, physically vigorous, and with such a will-to-power that the licks from reality are savored rather than resented. The dialogue too, for a small-budget film made by HBO before Home Box Office’s cultural ascendancy, is marvelously written. Words are sculpted to Platonically match the ideal of an action script. There is a clear decline in the quality of commercial film when this dialogue, coupled with the physically intense real stunt-action sequences done by the lead actors, is vastly superior to the cheap tricks which can be computationally programmed to jut out onto a wide screen for entertainment. While there is no depth to the plot, there is tension and intrigue. But even this is nestled in such an anthropological feast of South Texan culture; of the fiery independency of men who would rather die alone than join the herd. And further, of men concerned about their patrol jobs being replaced by artificial intelligence. It seems as though there is nothing new under the sun after all. One last thought, and this is regarding the nobility of one of the lead characters. The enforcement of righteousness by men of his stature, a stature which is not socially but spiritually significant, of one who aforementioned revels in being a beast of prey in the world yet directs his aim in an edifying manner, is the secret bedrock to the growth of an evolved society. This, the righteous man of the world, would have his actions transcribed by sages to be passed down to posterity in the hopes it inspires a future breed to rival him. As Camus noted, the struggle for the heights is enough to fill a man’s heart. And what is the highest struggle but the reach for a higher mode of being, to gift it to better mankind?